Perfect weather welcomed the World Superbike Championship riders on the first day of testing at the Ricardo Tormo Circuit in Valencia. A high of 30 degrees the air temperature were recorded, while the track reached just over 40 degrees, allowing the Winston Ten Kate Honda Team riders to take positive early steps. Two more days are still available for the four white and blue Winston Ten Kate Honda Team's musketeers to improve and prepare their bikes for the third round of the Superbike World Championship programmed on April 23, also at Valencia. "It's good to be back racing in Europe even if we have already had some satisfying results in Qatar and Phillip Island. Regarding the Superbike boys, I am very happy to see Karl back strongly in the top five, after the first two races in which he had some difficulties. He is improving step by step. With James, we are trying different parts and pieces but we still haven't found the right setting. Here in Valencia the track situation is always strange because it changes so much from the morning to the afternoon and it hasn't been easy to adjust the bike from one session to the other. But this is why it's good to be here for the test, it is useful to learn more and more about the bike and about our riders' preferences. I am quite sure we'll be able to pick it up tomorrow." "The first day has been pretty good for us. We made some adjustments to prepare our bike and results have come. The problems I had during the Australian races are mainly gone and I am positive about the work we will be able to do in the next couple of days. I fell during the afternoon session because I expected the front tyre I was trying to be a lot better, but I guess I pushed a bit too much and found myself on the ground. Not a big problem as that was a quite slow turn and luckily I didn't hurt myself, which is the main thing." The second day of the Valencia SBK tests proved to be not as hot as day one, but still provided a good platform for the World Superbike riders to get down to work. A light wind characterized the day but without disturbing the work in progress on track too much. For the Supersport boys, Charpentier and Sofuoglu, it was another day in front of everybody while real improvements were made by Karl and James, on the Winston Ten Kate Honda CBR1000RRs. Tomorrow is the final day of testing before the restart of the season in Valencia on April 23, where James and Sebastien will try to attain and maintain the lead in their respective World championships. "On the Superbike side of things we are still facing some problems to find a good set up around here. Like I said yesterday we are testing to learn more and more about this year's machinery. James has some chattering problems at the moment, but Karl Muggeridge is not encountering this. Karl is improving step by step. I think tomorrow we will be able to solve the chatter and improve the lap times with James. " "The time has gotten better on the second bike but bike one had some problems. This morning I hurt my back somehow and it surely didn't help me through the afternoon session. Also, the weather wasn't the best this afternoon, due to a quite strong wind, but apart from these things I can consider myself satisfied with the work we did today. Tomorrow we'll concentrate on pushing the bike a bit more and try some long runs. We'll also try some qualifying tyres that Pirelli will provide us with." In the words of Doctor Corbascio the evaluation of the Australian rider is thus: "The x-ray in the hospital has showed a fracture on the D12, twelfth spine, and on the L2, lumbar 2. These two vertebrae are really important; therefore I believe Karl will not be able to step back on a bike much before 40 days have passed. He will surely miss the Valencia race and after some more medical control we will evaluate if he will be in the best condition to race in Monza in the first weekend of May. In this period he will have to wear a cast which will totally immobilize the damaged area." 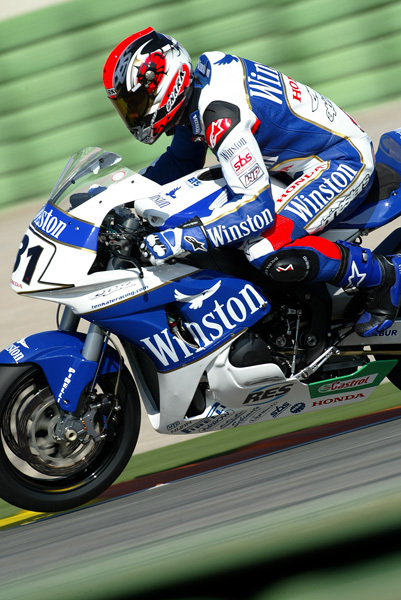 Karl's team-mate, James Toseland, couldn't end the morning session due to a fall, as he badly hit his head after a spectacular high side, flying into the air before landing heavily. The tough English rider, after the ritual medical checks, was able to be back on his bike for the two hour afternoon session. "Pretty bad ending of a test for us with two riders in the medical centre, after just half of the morning session. At that time the track reached its best condition and, unluckily, we weren't able to use it. James got a big hit on the head which left him not in the best possible condition for the afternoon session. But Karl got the worst of it and has fractured his second vertebra, but he should be back with us in a month. It happened during the in-lap, which is strange, because he was not pushing that hard. None of our riders used qualifying tyres in the morning and this is the explanation why we are a bit behind in the standings. I am sure we could have been in the top five or six with both riders because most of the problems we had in the first two days were almost solved. ."
"Not the best day of my life, but I guess this sort of thing can happen in our job. I knew I was hurt straight away, the pain was quite strong. Now all I can do is to relax so that I can be back in top form as soon as possible. Tomorrow I will go to a specialist in Switzerland and we will see what the latest situation is. I want to thank the doctors from the Clinica Mobile who have been wonderful today."